Don't forget Santa and his reindeer this Christmas! Leave a special treat for Santa and his reindeer with our Santa's Treat Table. Click the table for a menu of hot cocoa or a cookie. Table has treats for santa and carrots for his reindeer. 1 Christmas santa's treat table. 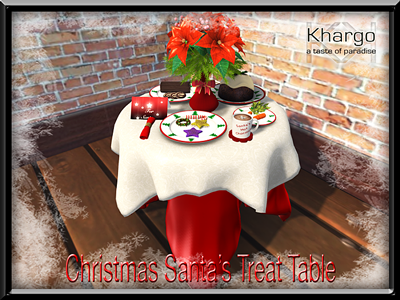 Find it in world at Khargo Christmas Market this weekend atr the special price of L$60 for My 60L Secret or on the Marketplace!